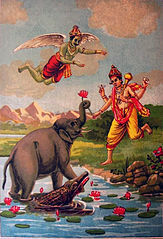 Gajendra was the King of elephants. One hot day, he proceeded to the lake with his family to cool off in its fresh waters. But from within the lake a crocodile appeared who attacked him and would not let go of him. When the family and relatives saw ‘death’ coming close to Gajendra, and everyone realised that everything was lost, they left Gajendra alone. Gajendra prayed: ‘Please help me O Lord! Save me from the clutches of Death! It is said that if one recites the Gajendra Prayer, one achieves liberation and freedom from frightening dreams! The Lord rushed to Gajendra’s aid. The latter offered the Lord a lotus flower. God attacked the crocodile and saved His Loved One. The world, is the lake where he plays the game of life with family and others. The crocodile is ‘Death and Difficulties’ which attack man. Neither family nor friend can liberate one from the clutch of death. According to The Indian Copyright Act, 1957 (Chapter V Section 25), Anonymous works, photographs, cinematographic works, sound recordings, government works, and works of corporate authorship or of international organizations enter the public domain 60 years after the date on which they were first published, counted from the beginning of the following calendar year (ie. as of 2017, works published prior to 1 January 1957 are considered public domain). Posthumous works (other than those above) enter the public domain after 60 years from publication date. Any other kind of work enters the public domain 60 years after the author's death. Text of laws, judicial opinions, and other government reports are free from copyright. Photographs created before 1958 are in the public domain 50 years after creation, as per the Copyright Act 1911.